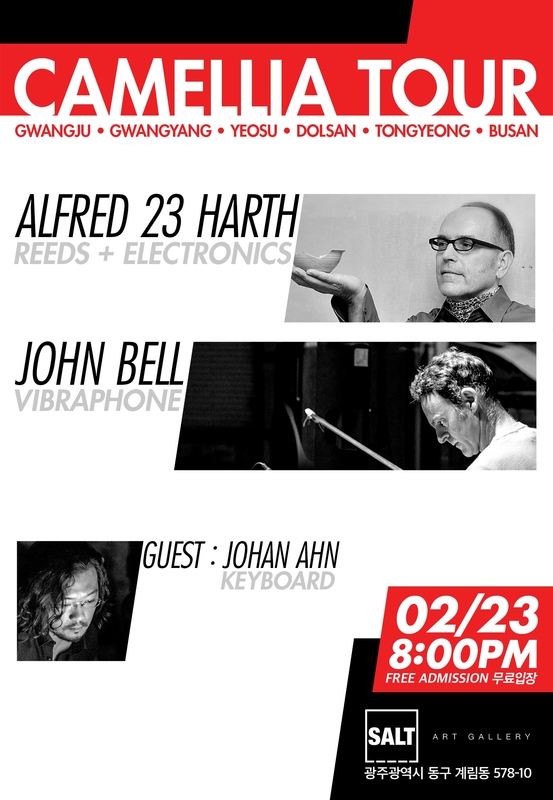 KSE’s long-term relationship with experimental music pioneer ALFRED 23 HARTH has resulted in more than a half-dozen albums, some documenting his working groups such as the duo GIFT FIG (with Carl Stone) and the quartet THE EXPATS, along with others which have allowed Mr. Harth to create bold and complex conceptual works, such as the MICRO-SAXO-PHONE series and the CHINA COLLECTION. 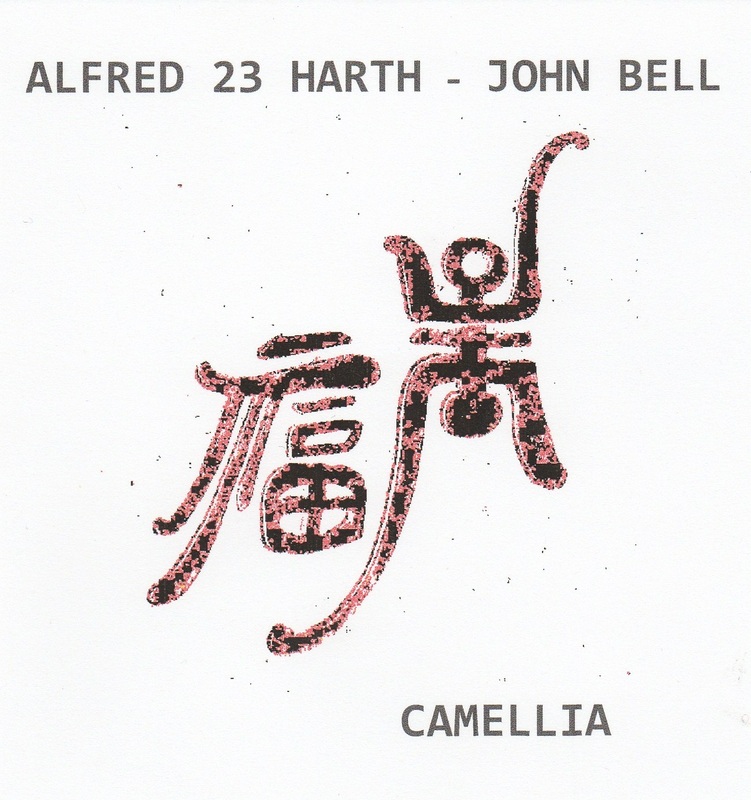 Harth’s KSE albums are a major body of work, and we’re proud to continue our fruitful relationship with Mr. Harth with this new album….CAMELLIA (KSE #318), a beautiful series of duets with vibraphonist JOHN TREVOR BELL, who is from New Zealand and presently works out of Seoul, Korea. The “Camellia” concept came out of a tour Harth and Bell did in early 2015 in the South coast area of Korea, where A23H included his art installations including the Camellia flower. And the Camellia flower somehow captures the understated beauty and elegance of this (primarily) soprano saxophone and vibes duo. Harth and Bell are tapping into a long chamber-jazz tradition–from the 1920’s duo and trio recordings of Bix and Tram (Bix Beiderbecke and Frank Trumbauer) such as Singing the Blues or For No Reason At All In “C” to the small recordings of the 30s with Benny Goodman, Teddy Wilson, and Lionel Hampton….to the wonderful reeds and vibes recordings of Gunter Hampel and Marion Brown and the small Chico Hamilton groups . Of course, Harth and Bell come from the post-modern side of the street, but the lyricism, the attention to small detail, the darting back-and-forth, the intuitive thursting and parrying of the duo (the music provides the same kind of joyous strategy one finds in first-rate fencing or tennis….the difference being Harth and Bell are on the same side, working TOGETHER) provide a playful but profound series of pieces rooted in DUO UNITY. There are 19 pieces, some composed by Harth, some composed by Bell, and the Harth pieces include ones dating back to circa 1980 and, in the case of “Waves Of Being,” the seminal THIS EARTH album where Harth worked with Paul Bley, Barre Phillips, Trilok Gurtu, and Maggie Nicols. 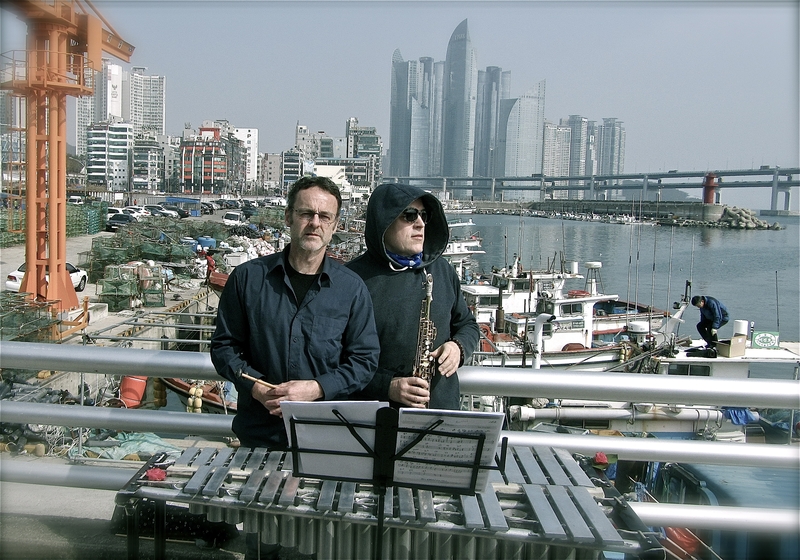 The compositions are extended and developed in what Harth and Bell call a “time-lapse” method of “playing clouds.” Bell explains that “Thanks mostly to Alfred’s guidance, but perhaps also due to the ironic peace and quiet of the Laubhuette studio (situated right next to the Demilitarized Zone) we stretched the tempos of those pieces to a cloud like slow motion.” However, there is a wide variety of tempos and rhythms here….from the languid dream-like haze one would associate with a late-period Chet Baker session to playful, spiralling quick-paced pieces reminiscent of Ornette Coleman. I’m also reminded of the live performances of Wayne Shorter (on soprano) and Herbie Hancock on the tour in support of their 1 & 1 duo album, where they would take pieces that ran 6 or 7 minutes on the album and extend them to 15 or 20 in concert, developing and deepening the pieces in ways that seemed so natural….and so inevitable! Yes, there are other instruments in use here—-Korean instruments, trombone, etc (and the ways in which Bell “extends” his vibes open the instrument up in surprising and lovely ways)—-but it’s essentially a Soprano Saxophone and Vibraphone album, which is why I’m making so many references to the tradition here, as I feel that people who enjoy that tradition, whether it be Bix and Tram, Brown and Hampel, or Shorter and Hancock, will LOVE this album. If they are not too familiar with Alfred 23 Harth’s body of work, this album may just be the perfect door of entry to it! It’s also great to welcome John Trevor Bell to the KSE family. He is performing with forward-thinking groups all the time in Asia, but of course, we don’t hear a lot about the Asian scene here in Texas! Mr. Harth will also be appearing on our KSE 10th Anniversary compilation, which will come out early in 2016. 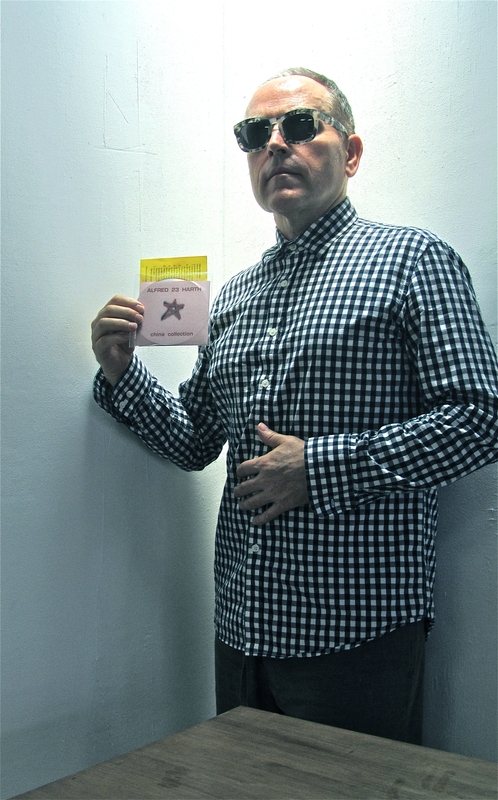 Alfred Harth: Bell & Harth started working as a duo at the Paju Festival in 2013 where Harth also brought in some of his poetry. In spring 2015 the duo had a so called „Camellia Tour“ along the South coast of Korea, Namhae, where Harth partly implemented his art installations including the camellia flower that is very common in that beautiful area along the islands of the South Sea. The CD Camellia is mainly about beauty and transitoriness and contains Harth’s compositions that date back to 1980. The duo developed a time-lapsed way of stretching the themes, what they call „playing clouds“. 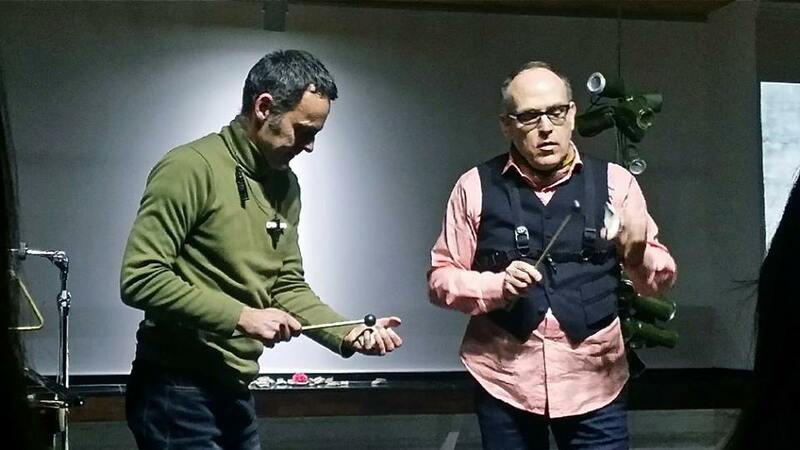 Bell & Harth both admire Korean traditional music, Gugak, and they refer to it in their improvisations by also playing traditional Korean instruments, Bell the Buk and Harth the Piri and Taepyeongseo. John Bell: I first met A23H in 2007 during my first music tour to South Korea. Previously I was not familiar with the vast and varied artistic output of Alfred Harth. 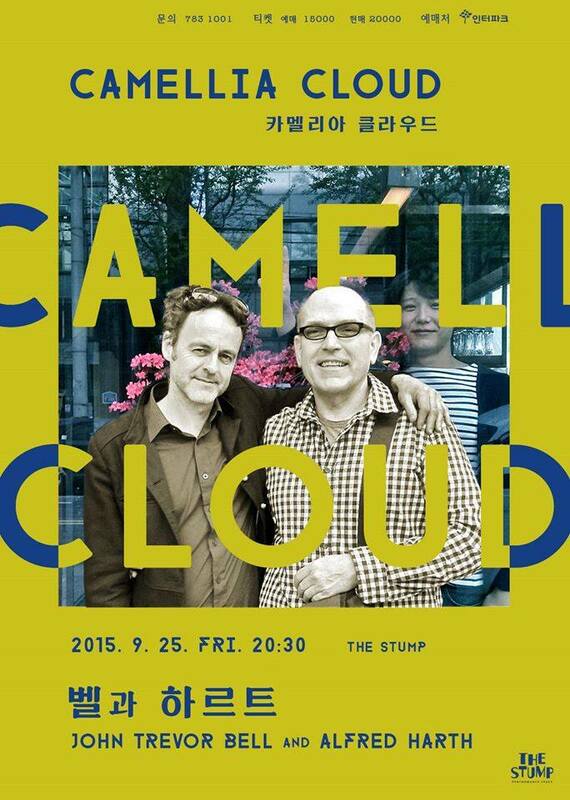 I kept in touch with Alfred after returning to New Zealand, and was pleasantly surprised when he agreed to perform an improvised duo with me at ‘Yogiga Gallery’ in Seoul shortly after I moved to Korea with my wife in 2013. We performed again as a duo in the Paju Free Music festival also in 2013. I spent much of 2014 in the Southern Hemisphere, but upon my return we resumed the duo project. In 2015 Alfred suggested we record some improvisations, but also some compositions of his (mostly from the 1980s and 90s). I was somewhat apprehensive about interpreting these compositions which had already been recorded by luminaries such as Maggie Nicols, Paul Bley, Sunbae Choi and Soojung Kae. Thanks mostly to Alfred’s guidance, but perhaps also due to the ironic peace and quiet of the Laubhuette studio (situated right next to the Demilitarized Zone) we stretched the tempos of those pieces to a cloud like slow motion. There are other moods in the duo sound, but I mostly think this cloud, even thick syrupy stratocumulus reflects some aspect of living in South Korea.